Alta Animal Hospital’s experienced support staff strive to provide personalized, compassionate care for our patients and clients alike. Dana is an Idaho native who has previously worked in the people side of the healthcare field. She has always had a passion for animals and is grateful for the opportunity to incorporate that passion into her career. For the past 5 years she was the Front Office Manager overseeing 40+ client service specialists in multiple locations. She also has experience in laboratory, pharmacy, and health information management. In her spare time she enjoys camping, exploring new places, horseback riding with her two horses Strider and Keisha, hiking with her four dogs Fred, Wilma, Abby and Fritz. She also loves playing with her 3 cats which she adopted and bottle raised after their mother was killed and their names are Bob Cat, Tom Cat and Kit Kat. She is excited to be a part of the Alta team and looks forward to working with everyone! Joanna has been with Alta since 2010. Her sunny disposition and her wonderful way of working with Alta patients bespeak of her compassion and love for animals. She is working towards her degree at Idaho State University, and when not busy with work and school she enjoys hiking, going to movies, and spending time with her family. Joanna shares her home with her cat Molly and sweet Pit Bull Karma. 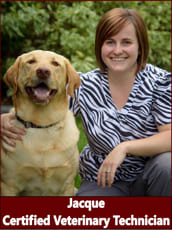 Erin worked in human medicine for 12 years before coming to join our team at Alta Animal Hospital. She is very passionate about animals and is thrilled to be able to work with them every day. When Erin isn't working she enjoys hanging out with her son, her family, and her small zoo at home consisting of 3 dogs, 2 cats, 2 turtles, 2 frogs and a rabbit. We are grateful to have Erin as part of our team. 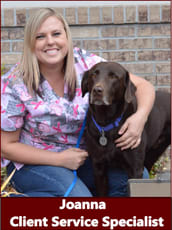 Jacque joined the Alta team as a Certified Veterinary Technician in the summer of 2015. Previously she has had experience working as a technician for clinics in the Magic Valley and Portneuf Valley. She is a graduate from the College of Southern Idaho and is originally from Boise, Idaho. Jacque and her husband welcomed their first child in Oct. 2018. As a family they like going on hikes around Pocatello, camping, and going on adventures with their three adorable dogs. 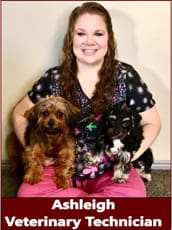 Aubrey joined the Alta Animal Hospital team in 2018. She loves being around animals. She has a tuxedo cat named Bo Jackson. She loves meeting new people and being able to help someone and impact their day. In her spare time Aubrey enjoys reading, hiking and traveling. Becca joined the Alta family in the beginning of 2017. Her favorite part of working at Alta is the sense of family and compassion that is shown towards humans and animals. 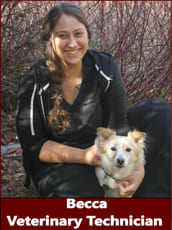 She is originally from Seattle, WA and is living in Pocatello to pursue her human nursing degree. She graduated with an A.A. in Veterinary Technology in Seattle in 2014, but has been in the field since 2011. Becca has worked in a variety of practices including general practice, specialty, ICU and ER settings. When not working she likes spending time with her cat and dog, going on hikes, and swimming. 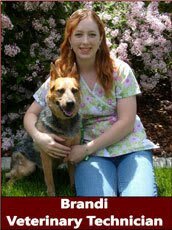 Brandi loves working with animals and helping them while always learning something new. She started working at a veterinary clinic while in high school. 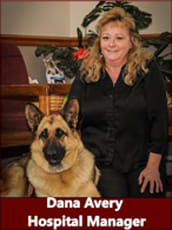 She worked with us at Alta Animal Hospital until taking some time off when she had a child. 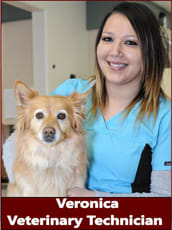 She has rejoined us at Alta Animal Hospital working part-time and is a wonderful addition to our staff. When she isn't working Brandi enjoys gardening, hiking, crafts, and spending time with her family. She has 6 cats and 1 dog at home. Veronica joined the Alta team in 2015. After relocating from Boise, she earned her B.S. in Business from Idaho State University. Veronica’s love for animals started at a young age and she is grateful for the opportunity to turn that love into a rewarding career. She spends her free time fishing, camping, hiking, and spending time with her family. Veronica enjoys sharing her home with her small pack of dogs. Elizabeth grew up on a ranch just south of Pocatello in McCammon, Idaho. There she learned the hard work required to maintain a ranch and the animals that live there. Those experiences encouraged her to seek a B.S. degree in Animal Veterinary Science from the University of Idaho, where she graduated in 2015. Elizabeth is very excited to be working with animals at Alta, where she can positively affect their lives on a daily basis. 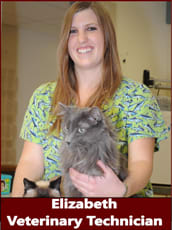 At home, Elizabeth has 2 cats, Joey a 17-year-old Nebling and Precious a 15-year-old Siamese. When not working, Elizabeth is very involved with the Marsh Valley Pioneer Days Rodeo, the Gamma Alpha Omega Sorority, and she is a volunteer fire fighter for the city of McCammon. Leah joined the Alta team in 2013. She earned her B.S. 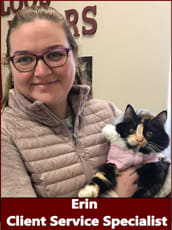 degree in Biology from Northland College in Ashland, Wisconsin and came to Alta with prior experience as a veterinary technician. She loves helping pets and their people and witnessing the power of the human-animal bond. When she's not working at Alta, Leah enjoys running, backpacking, and snowshoeing in the mountains. She shares her home with her husband Jeremy, her rescue dog Puq, and three rescued cats. Brandon joined the Alta team in 2015. After serving a tour in Iraq, we are delighted to have him with us full time! 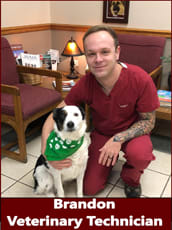 Brandon has several years of experience working in Veterinary Medicine. He enjoys working with different dog and cat breeds and learning more each day. He occupies his free time by traveling, hiking, mountain biking, and being outdoors with his wife and their two dogs. Liberty joined the Alta family in 2018 after moving from California. She has always had a love for all animals and shares her home with a lot of fun pets including a tarantula named Nyla. 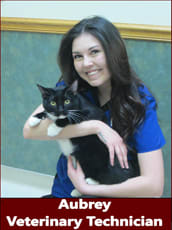 When not working at Alta, Liberty works at the Pocatello Pet Lodge and enjoys the fun interactions with awesome pets! 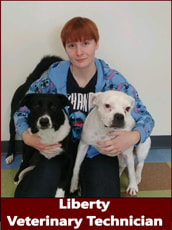 When Liberty gets a moment to spare, she enjoys reading and spending time with her family. 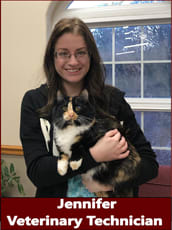 Jennifer joined the Alta family in 2018 after graduating with her degree from Idaho State University. She loves helping animals and being a part of ensuring they receive the best care. She shares her home with her Chinchilla named Khalessi and her cat named Yoda. In her free time, she enjoys golfing, cross country skiing, and kayaking. 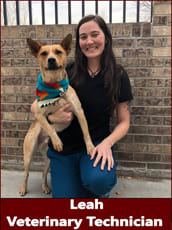 Ashleigh came to Alta in 2018 after relocating to Pocatello from McCammon. She is currently pursing her degree in Pre-Veterinary Medicine at Idaho State University. When not busy with school and work she likes seeing movies, swimming, and relaxes by doing yoga. Ashleigh shares her home with her two small dogs, Ozzey and Rosie. Did you know pets need blood too? Our hospital treats numerous patients throughout the year that require blood or plasma transfusions vital to their recovery process. Our hospital maintains a blood donor program that is comprised of volunteer pets. Thanks to the Blood Donors at Alta these pets have a fighting chance to overcome serious trauma or illnesses. 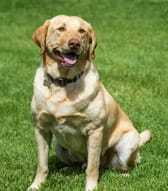 Hurley, a male 5 year old Labrador retriever, was adopted by his current owner after she fell in love with his rambunctious personality in 2013. 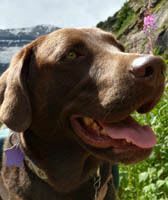 Blood typing performed in November 2015 revealed that Hurley has a Universal Donor blood type, meaning he can safely donate blood to any dog in need of blood. Hurley loves splashing in his kiddie pool and going on hikes. He has a little sister, Letty, a Boxer/Labrador mix, who loves to wrestle and keep Hurley on his toes! Reidar, a Labrador Retriever, was born in April of 2007. He was adopted by his current owner several months later while he was battling a life threatening illness. Thank goodness he recovered completely! Now he loves playing Frisbee and running and hiking in the mountains. He even carries his own water and treats in a doggie backpack on long trips! 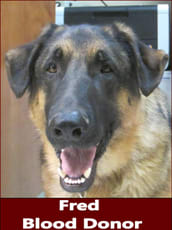 Reidar began donating blood in 2009 at Alta Animal Hospital. Schultz was born June 10th, 2014. He loves to go camping, swimming in lakes, and playing fetch. 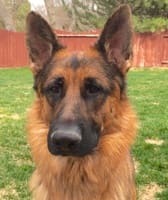 He has a eight year old sister, Szora (German Shepherd), and an eight year old brother, Gunny (Boston Terrier). He is donating blood to pay it forward for Gunny who almost died due to an autoimmune disease that destroyed his red blood cells. Without doggy blood donors Gunny wouldn't have survived his ordeal. Wilma is a German Shepherd born in 2013. Blood typing performed in March of 2017 showed Wilma to have a Universal Donor blood type, meaning she can safely donate blood to any dog. Wilma has a twin brother named Fred and a young Border Collie brother named Gus. Wilma spends her days playing, hiking and swimming with her brothers, her people and the family cats. 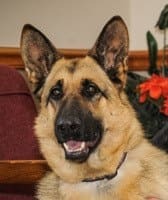 Fred is a German Shepherd born in 2013. He had his blood typing test in the summer of 2018. His twin sister Wilma is also a donor! Fred loves to spend his time playing with his pet siblings and his people.